Last year, our friends the Juliano’s gifted a subscription for Bon Appétit® magazine to us. I was so excited when they told me, mostly because of the fabulous food photos I’d get to admire and try to emulate. Admittedly, I was afraid the recipes would be beyond our abilities. I was wrong… the recipes are beyond MY abilities, but not Jon’s. The kid is a whiz in the kitchen. 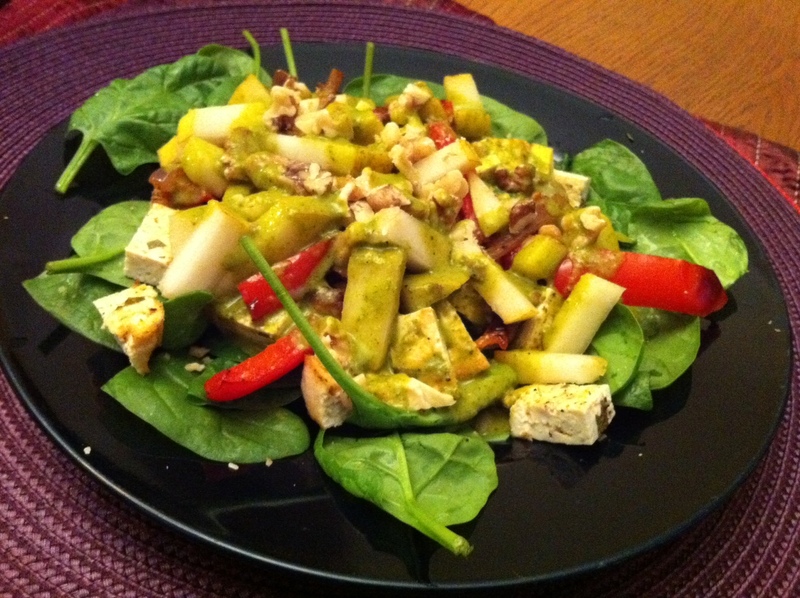 Last night, he combined a recipe for Citrus-Marinated Tofu with Onions and Peppers with a fresh spinach salad adorned with walnuts and pears. Perhaps the best part about the dish was the dressing he made by blending the remaining marinade from the tofu with cilantro and honey. This salad tastes so fresh. The flavor combinations are out of this world. I am adding it to the list of potentials for The Ginger Kitchen Food Truck menu. Preheat oven to 450 degrees. Line a large rimmed baking sheet with foil. Combine 1/4 cup cilantro, lime juice, garlic, 3 tsp. cumin, and 1/2 tsp. paprika in a small bowl. Season with salt and pepper. Pour 1/2 cup of marinade into a resealable bag. Add tofu. Seal bag; shake to coat. Let marinate at room temperature, turning occasionally, for 10-15 minutes. Meanwhile, transfer remaining marinade to a blender. Add 1/4 cup cilantro, 2 Tbsp. oil, and honey, puree until smooth. Season sauce with salt and pepper. Combine onion and peppers in a large bowl. Toss with remaining 2 Tbsp. oil, 1/2 tsp. cumin, and 1/4 tsp. paprika. Seaosn with salt and pepper. Drain tofu. Season both sides with salt and pepper and place in a single layer on one side of prepared sheet. Spread vegetables in a single layer opposite tofu. Roast, stirring occassionally until vegetables are tender and tofu is lightly browned, 20-25 minutes. Prepare eat plate with a layer of spinach. Divide tofu, onions and peppers among plates, drizzle with sauce, and top with walnuts and pears. Garnish with remaining 1/4 cup cilantro. I made this last night for dinner. Very good and got a good workout in with the chopping prep. Might try incorporating some clementine sections next time. Thanks Jon and Amber for sharing!